81. Plays Modelled on the Noh (1916). Edited by Donald Gallup. Toledo: Friends of the University of Toledo Libraries, 1987. Versions of draft plays from the Pound Archive at Yale (90a) and related material. Gallup notes in his introduction that ‘none of [these plays] ever seem to have been performed’. The introduction includes quotation from two previously unpublished letters from Pound to his father, and his letter to his mother about ‘doing some “Noh” of [his] own’ previously noted in Slatin and Niikura (108 and 147). See Nicholls (204) for argumentation that Pound’s use of time in these plays and in the nô itself affected the methodology of The Cantos. a. To Homer Pound, February 1916. 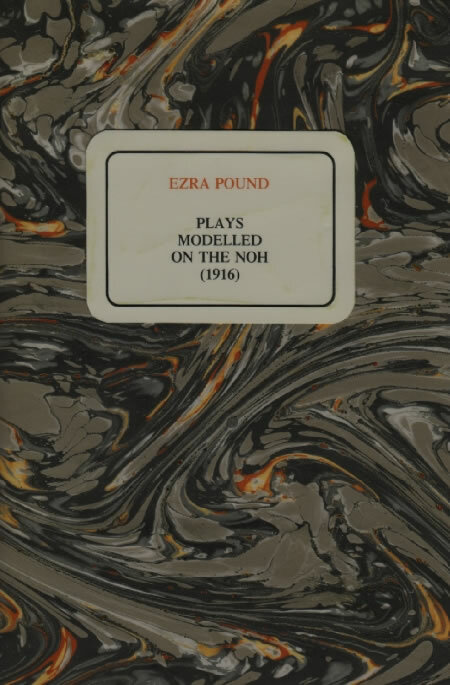 Pound mentions that both he and Yeats are writing plays based on the nô, and—in words remarkably like those Yeats himself was to use about his experiments with the form (see especially BL11)—that these will be part of a ‘new dramatic movement, plays which wont need a stage, and which wont need a thousand people for 150 nights to pay the expenses of production’. He adds that one of his plays will be performed along with one of Yeats’s in ‘Lady Cunard’s big room’, but this was not to come to pass. Pound was in attendance for rehearsals of At the Hawk’s Well (BL12) and in the audience at the first performance in Lady Cunard’s drawing room on 2 April, but the program did not include his work. b. To Homer Pound, 7 April 1916. Pound refers again to his own ‘dialogue play’ (see a) and notes that while it was not performed along with Yeats’s play at the Lady Cunard’s drawing room, it is ‘supposedly to be done next month at Claridges’. Yeats’s play was ‘a success . . . [but] not yet quite in order’, for the ‘whole scheme of things [is] too new’. c. The Protagonist. A farce that Gallup’s introduction suggests is ‘modelled specifically on the Japanese kyôgen’, though similarities to kyôgen are superficial, amounting mainly to comic devices derived from the foolishness of two unsophisticated policemen. Gallup notes also that the typescript at Yale has many corrections and alterations that ‘indicate that Pound had not finally decided on the exact phrasing of the closing speeches’. Laughlin reports that when he once asked Pound if he had written fiction Pound responded that he ‘had done a “Kyogen” about two policemen—but he hoped it was lost’ (179, p. 148). d. The Consolations of Matrimony. Another farce, which Gallup rightly notes is the ‘least finished’ of the works collected here, so much so that it is ‘difficult to decipher Pound’s intentions’. 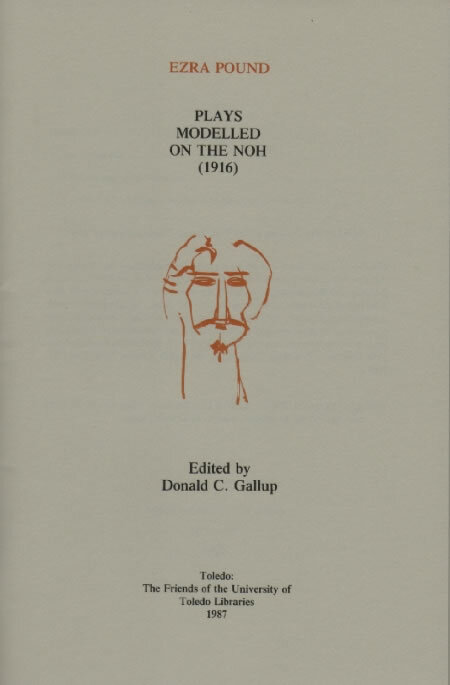 The manuscript version, according to Longenbach (183), ‘contains a list of the Noh plays Pound was translating’, and the play itself ‘extends the experiments with Irish speech that Pound began in his translations’ of the nô, but similarities to the nô are not readily apparent. Longenbach believes nonetheless that this is the work Pound had in mind when he wrote to his father that one of his own works would be performed along with one of Yeats’s in ‘Lady Cunard’s big room’ (see a). e. ‘De Musset’s “A Supper at the House of Mademoiselle Rachel”’. Pound apparently intended this work to precede a reading in English translation of de Musset’s play. Explicit references to the nô in general and to Nishikigi (8) in particular indicate that Pound believes his ‘Japanese things’ are not well understood, and his description of how ‘Japanese emotion’ allows for a ‘reconstructing of the past’ reads like a blueprint for the methodology of The Cantos: ‘You tell me you do not want Japanese things, that these new plays must be European. Still it is a Japanese play [Nishikigi] that gives me the closest parallel to my thought. . . . I think you all have your heroes and heroines. . . . [And] if you went to Tuileries and really saw Marie Antoinette? If suddenly by the Tiber you saw re-acted, re-arranged, re-presented the events and heard the exact speeches on the morning after the Duke of Gandia was murdered? Ah no, you would not [then] complain about my giving you Japanese emotion’. See especially Longenbach (183, pp. 226ff.) for description of how this passage allies Pound’s understanding of the nô to the ‘ghosts patched with histories’ (see 27a and 56a) that appear in the early Cantos (27) and reverberate throughout the mature writing both of Pound and of Yeats. f. Tristan. Pound’s version of the story of Tristan and Yseult, the most finished of the works presented here, is based closely on the structure of the mugen nô: as in most mugen nô the work includes an opening verse invocation of scene, a traveller who has come from afar to a mysterious place, a local inhabitant who understands more than she allows of the story associated with the place, and finally the apparition of the ghosts bound to it, in this case Tristan and Yseult, who meet, perform a dance, and fade away as the traveller looks on. See Longenbach for analysis of how the work ‘marries’ Nishikigi with Tristan and Yseult, mirrors Yeats’s ‘crossing’ of Nishikigi with the story of Diarmuid and Dervorgilla in The Dreaming of the Bones (BL14a), and informs Pound’s understanding of how the nô might provide a means of proceeding with his ‘long vorticist poem’ in progress, The Cantos.